This is a versatile cloning toolkit for constructing fully-customizable three-part fusion proteins, based on the MultiSite Gateway® cloning kit from Life Technologies. This kit consists of 12 individually packaged plasmids, which are shipped as bacterial stabs at room temperature. Individual plasmids can be ordered at $65 per plasmid, and will be shipped as bacterial stabs. This is a versatile cloning toolkit for constructing fully-customizable three-part fusion proteins, based on the MultiSite Gateway® cloning kit from Life Technologies. The fusion protein components (i.e. 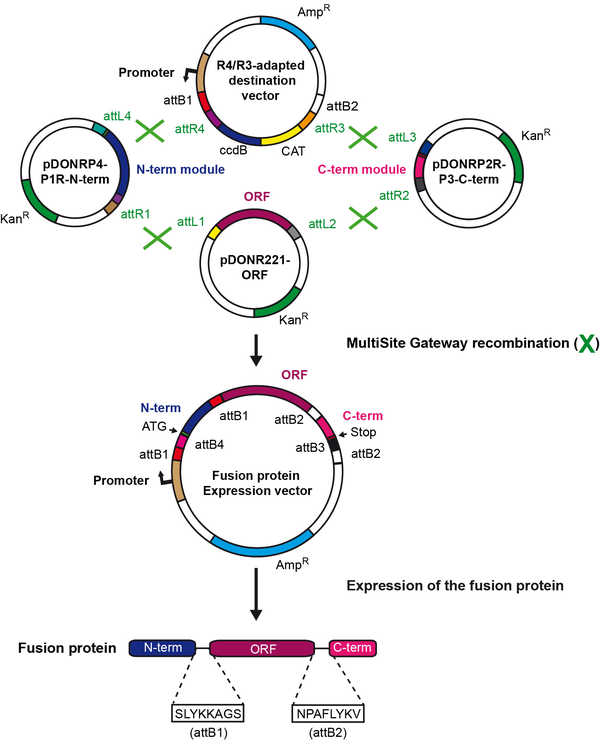 an ORF of interest plus two flanking modules) are encoded in the three plasmids integral to the original MultiSite Gateway® kit. These can recombine with any purposely-engineered destination vector that uses a heterologous promoter external to the MultiSite Gateway® cassette, leading to the in-frame cloning of a cDNA encoding a fusion protein. In its current form, the toolkit contains a set of 12 promoter-less Gateway® entry clones (mostly encoding fluorescent protein cDNAs: mKate2, EGFP, ECFP, EYFP, but also an epitope tags cassette and a polyA signal) that provide N-terminal and C-terminal flanking modules when used in MultiSite Gateway reactions with other entry clones encoding the ORFs of interest. "The plasmid kit used for constructing fusion proteins was a gift from Anna Planas and Tomas Santalucia (Addgene kit #1000000050)"